Wow, it’s almost July and I never wrote anything about Boston 2018! Well, better late than never. Most of you know the story this year was the weather — cold, windy, and rainy. I estimate we got at least 2″ of rain during the run and fought 20-30 mph head winds almost the entire way. For most roadies, it was probably a downer. For me, someone who doesn’t run road marathons more than once every couple years, it added to the adventure. 🙂 Also, as a mountain ultra runner, we are pretty used to conditions that can be quite bad for long periods of time. My friend and co-worker offered a place to stay in Hopkinton the night before, which I jumped at. I also asked if my good NC friend David could crash too, and he was welcomed. We jumped at the chance — the ability to skip the long bus lines in Boston and not have to hang in the athletes village for a few hours — especially in that weather, was incredible! My family had come to Boston for the weekend, but Sunday night I left them after we had dinner with Matt and family, and headed to his place. We were able to sleep in and have a leisurely morning before Matt drove us to the secondary shuttle spot in Hopkinton, which was then just a 10 minute bus ride from the village. As we were getting off the bus in the village, I heard them calling my wave already! So I shuffled through the village, which took a very long time as everyone was trying to stay on the pavement — the grass was a total mud pit. Much of it must have been 4-6 inches of mud. People had extra shoes or were wearing trash bags or grocery bags on their feet, but it was still a disaster. I eventually got out of the village and was walking towards the start, but now time was a bit short and I had to skip the port-o-pot lines. I got to corral 3 and was surprised to make it to the very front just 2-3 minutes before gun time. I stripped off my throw away pants and trash bag top, and was ready to go. Side note: I was really amazed, however, by the clothes some people were wearing. Singlets, sports bras, short shorts… Wow! For sub 30F feels like with the wind and the rain, I thought that was crazy. I had on Ruhn compression shorts, and then a 200 weight ice breaker top, arm warmers, gloves, and a rain shell. Also, a hat to keep the water out of my eyes and a buff. There’s not much more to write. I was never that cold (until after I finished and had to wait about 10 minutes for the family to bring my warm clothes — I had no clothes at the finish due to my Hopkinton start), and ran pretty steady. I had one long mile split (8:34) when I hit the port-o-pot at mile 9. This was the same spot Shalane was in and out of in something like 10s, while it took me considerably longer (but I had been holding it for a long time!) I ran a 3:26 and change, which while 8 minutes slower than my qualifying time, I was pretty happy with considering the conditions and my running state heading in. That min/mile at 25.2 has to be a mistake — I was moving the last couple of miles! Here are a collection of videos Work has put together… I’ll add more here if Work does any more. Anyway, I chose pod 1 so I’d be with Jase, Matt, and Dan. They told me they’d be happy to run 9:00’s for the 1st 25k, so that’s what we did. Well, the 1st couple were a touch fast, but the guys backed off for me. But it soon became apparent that I was struggling at even 9:00’s. Where did yesterday’s easy 8:45’s go? And then I was struggling at 9:15’s. I tried not to slow them down too much, but then my stomach started to turn. I watched them quickly run off after 25k, which allowed me to do my own thing. I soon had to make a pit stop to move the bowels, but immediately had hot chills for 5-10 minutes. Uh-oh! The chills passed, and then my stomach turned nauseous. At 30k I asked for a pepto tab, took one, and 20 minutes later when nothing had changed, took another. I found the thought of taking in food at this point stomach turning. I slowed some more, but kept working at it. I finally hit the turn up the mountain, and after 3-4 miles of mostly power hiking with a few seconds of running here and there, finally started to get some food down. I eventually left the low places, but never felt as strong as I had in the runs earlier in the week. I’m sure much of it had to do with the building fatigue of 150 miles in 7 days, and some of it had to do with Haitian food and beverages eventually catching up to me. But I was able to maintain a good power hike/run combo to the top (which took forever), and then start to run down (which also took forever!). There’s water down there – the finish! When I hit the 75k mark, with 9k to go, I was told Josh was catching me. I decided to keep moving at my slow walk/run combo, as I thought waiting might allow stiffness to set in and make it difficult to keep moving. When I reached town, with just a couple of miles to go, Jules was there and he let me know I was to have a truck “lead” me through town as there were several turns. We were making our way pretty good, and even saw some of the crew pointing in the direction to the finish, but at one point reached a place where the driver wasn’t sure how to proceed. He asked people on the side of the road where I was supposed to run, but no luck, and then called the crew, but we still weren’t sure. Eventually Josh showed up, and he said just go straight. But he was bonking hard! Luckily, Peaches had some beef jerky that he threw down, and then we were able to run it in together. The finish! 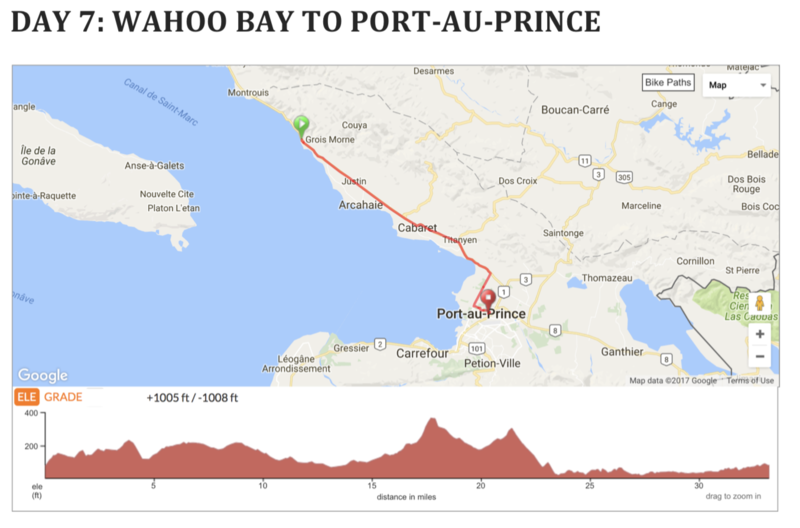 200+ miles across Haiti, coast to coast! More shots from the hotel level. I got some food in, and headed back down to the finish to watch a few more runners come in. I’ll have to write a follow-up post soon. Back at it on day 7. 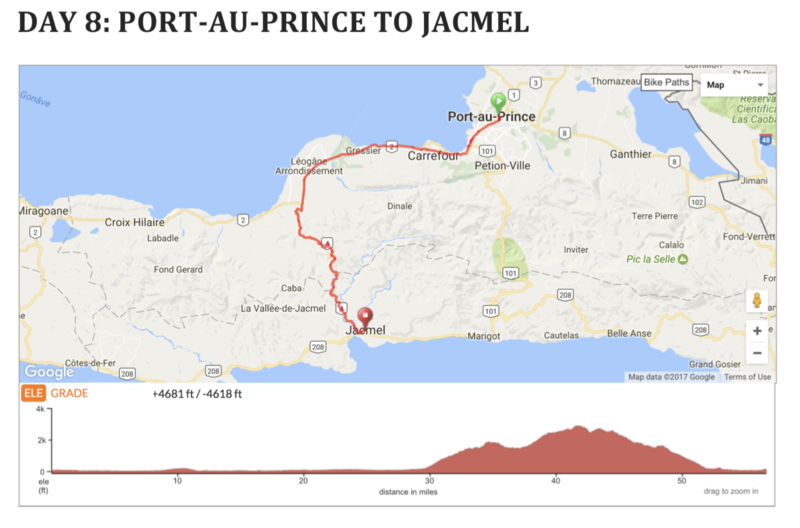 We were up early and running just after five, with today’s route taking us a little over 27 miles in to Port-au-Prince, a relatively flat section that would be busy with traffic. I knew early the rest day had done a lot of good – I felt really good and had to hold back all day. Early on I thought about trying to hang With Jase, Dan, and Matt, but decided better of it. 28 miles is a long ways and we have a quick turn around. We will depart from The Eucalyptus Village by midnight and start the final 52 mile push shortly there after. Burning trash – something we’ve seen a lot of! So after Jase, Matt, Dan and I finished, they put us four in a truck to head to The Eucalyptus House, which is a bit of an Oasis in Port-au-Prince. Sort of a dorm style retreat. We’ll be here until midnight or so and then take the buses and trucks a bit out of PaP before we start running. Today’s been pretty emotional. After sleeping in until just before six :-/, we had a leisurely morning of good coffee and then breakfast. We soon piled into the bus and vans to Menelas, the community Work supports. We actually started in the community of Truitier near (in?) the landfill near Menelas, where plastic bottles are recovered and turned into fabric by Threads, Works sister company. Viv took some time to explain the history of work and some of the programs they offer. Two thousand people live Truitier in/near the landfill. And this is Haiti’s only landfill, which explains why we’ve seen so much trash everywhere – there just aren’t any trash services. Here are some of the recovered bottles. Besides Threads, HP buys the recycled plastic for ink cartridges. From there we drove the few minutes to Menelas, where we got to see the home of Giordani and meet his family. He took the time to explain how Work has helped him. He will graduate this year and become a tap tap driver. He used the money he earned on last year’s run to build a new foundation next to his current sheet metal home, which currently sleeps 11! After that, we went to the local school, went to the roof, and were able to see the entire area, which gives a sense of the scale. Rather than look at the problem of poverty and say it’s just too big to solve, Work solves the problem one family at a time in the community they have chosen to support. Before we left, each runner and crew was given a pin from someone Work supports, in the outline of Haiti, with our running route marked, and a heart over Menelas. Tomorrow we start early for what looks to be a tough 28 – we drove all of it today on the way to Menalus. Then we’ll have about 12-13 hours at a guest house, before we take off on the final 52 at midnight. Today was another 5 a.m. start, with 20 miles of rolling pavement (and sun after ~ 7:30! ), but the destination is something we’ve all been looking forward to – the resort Wahoo Bay! That, and the fact that tomorrow is our one rest day. Much needed for all of us. I started at my usual conservative pace, coming in to the 10k near a large group. From there we started to spread out, and I ended up on my own for most of the day. From around mile 13-14 on, I really felt a lot of fatigue in my legs. Expected after 100+ miles over 5 days! I finished in a little over three hours. I didn’t take quite as many photos today, but here they are. Here are some shots of the resort. I’m sure I’ll take more later and will updated this post then. This is the first hotel where I’ve actually seen other guests. The beauty and cleanliness of this area shows how much potential all of Haiti could have with the right economic development, clean up, etc. Shots added later, some Duy Nugyen, some me. We all knew today would be tough. Thirty four miles, mostly exposed once the sun came up, and extremely hot. By the end, I was calling it “trail runners hell” — 34 miles of pavement in the sun, with one small hill, having to dodge and avoid cars/motos most of the way, especially in the busy towns. I ran the first 10k with Josh, and we talked music and HRCA and many other things. I spotted a couple of abandoned wrecked cars, hoping this wasn’t a sign of future carnage on today’s run for the team. At the 10k, I picked up with Jalyen and Jacque for a few shared miles. I saw this cemetery which reminded me of the one Kelly and I saw in Barcelona. And also this mural on a random wall. At the 15k, I picked up with Dan and Ozzie and we shared at least fifteen miles running in a strong pace line. This section was the infamous rice paddies, which truly seems to go on forever. And this is when it started to get really hot – still with 30k to go! The three of us eventually separated, with Dan in front, then me, then Ozzie. The town was pretty busy and I found myself walking some – but I might have used the busyness as an excuse! I was so ready to be done! After about 3 miles in town, I got to the finish where Dan, Matt, and Jase had come through ~10-12 minutes before me. Jase and I opted for omelettes and fries, which took a long time to come out, but they hit the spot! 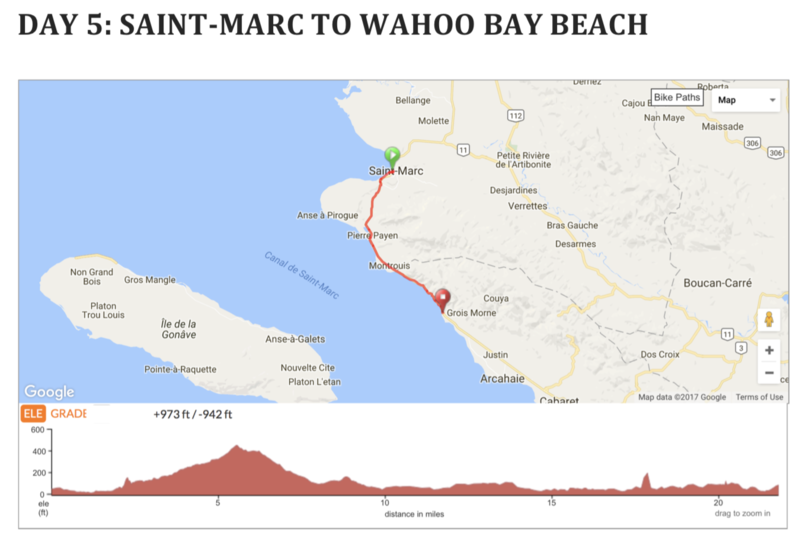 Tomorrow is another 20 miles, when we reach Wahoo Bay, which I’ve heard is really nice. We’ll then have a rest day from running, but we will go in to Menalus to meet the some of the families that Work is supporting.